Stop by the Merchandise Mart this weekend and check out work from over 600 artists. 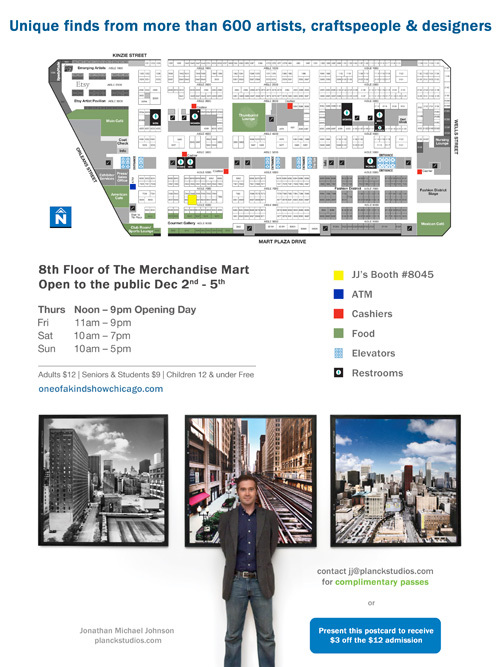 I'm back at the Merchandise Mart this week - this time I'm camped out from Thursday through Sunday, on the 8th floor at booth #8045. I'm joining over 600 other artists for the One of a Kind Show. If you have the time and are in town, definitely stop by and say hi. I'll have a ton of work on display and prints of all sizes available for purchase - starting at $100. This is a great opportunity to get your holiday shopping out of the way and support local artists. The One of a Kind Show is normally $12 admission, but with this link, you can print 2 complimentary tickets, good for all 4 days of the event (warning - signup required).